The Japanese Bantam is a breed that only comes in the one size: Small. They serves as great pets and show birds, but that's it. Still, they live to be 13 and are helpful is eating weed seeds and insects in the yard. While a dual purpose breed, the Java is best when used for meat production as they grow big and they grow fast. They enjoy warm weather, but will need a well-insulated coup in the winter months. 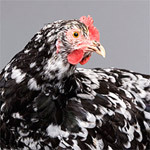 The Jersey Giant is the largest breed of chicken, though because of their huge size it takes them too long to mature to be commercially viable. Regardless, they make excellent chickens on even small farms.